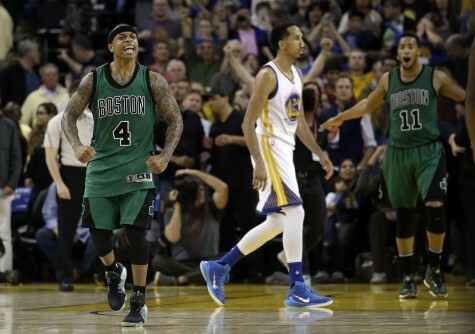 I was sitting on a plane Friday night, scrolling through my Twitter feed when it became filled with GIFs, exclamation marks and party popper emojis to celebrate the Celtics defeat of the Warriors in Oakland, snapping Golden State’s 54-game home win streak, their last home loss coming 430 days prior. Not only was the home streak lost, but the quest to top the ’96 Bulls’ 73 wins got much, much harder. The Celtics win was an upset, a shock, even, considering Jae Crowder was recovering from the effects of a high ankle sprain. The Celtics just feel like the classic underdog team from a sports movie: young, genius coach, unselfish play and Isiah Thomas, the 5’9 point guard who doesn’t look like a guy who could even score 20-a-night in high school, but somehow does it in the NBA. So, it was a seemingly obvious choice of who to pull for in the game. We always back the underdog. While they were rooting for one shocker, I was rooting for another. Every so often, in sports, a team or athlete reaches the point where they are no longer just battling for wins or championships. They are chasing history, the toughest opponent of all. When Steph, Klay and Draymond take the court, they aren’t going against the 2016 Celtics, Timberwolves, or Grizzlies anymore. They’re going against every team that has ever played in the NBA. They’re going against Michael, Larry, and Magic. They have the best shot in 20 years to top the Bulls, vaulting themselves into conversation as one of the best teams ever – in any sport. That’s as wild an underdog story as Rocky. Michael Jordan has reached mythical status in America, where people seem to think he never lost a game. Surely he could never be topped. Then came the Warriors, and Steph and Draymond stared down Michael and Scottie. They haven’t blinked. The Warriors aren’t the first to become underdogs to sports history. Madison Bumgarner of the dirty Giants reached that point when he dazzled his way through the 2014 MLB playoffs. Early Tiger Woods was already the horrible person he is today, but you rooted for him because you never thought anybody would be able to top Jack Nicklaus. Michael Phelps did it in Beijing, each win left us willing him to eight golds. Tom Brady and Bill Belichick did it too in 2007 when they nearly went undefeated. They all reached a point where they left us with no choice but to fall in line and join the fan club, for fear that we’ll never see something like it again. That’s the point the Warriors have reached, but still, they haven’t gotten that united support like those before them. The holdout manifested itself on Twitter, and it’s a result of Twitter as well. Twitter Culture, ironically born and bred right in Golden State’s backyard, has fostered a community of the deepest blacks and the brightest whites. Everything has a label, and every label ends with “…of all time. So, on Friday, when the Celtics had the lead at halftime, Twitter took the quick look, the easy look and said, “The underdog is winning! Always pull for the underdog! This is the wildest thing of all time! !” They were focused on a paint stroke and never took a step back to see the whole painting. They never saw that the masterpiece was almost finished, and anybody that said so was sentenced to internet death. They were labeled a troll. But the real troll is everybody who is blinded by one moment over an entire lifetime of basketball. The Warriors have earned our support. This is historic, and we should pull for that. We should pull for that because there might never be another team so perfectly constructed. We should pull for that because every game has the potential to feature the wildest shots you’ve ever seen. We should pull for that because we pull for upsets, and what is more shocking than taking down history himself. Well stated! Really good column. Well put Levin! we only see history occasionally…like when the horns beat the mighty sooners…its rare! !